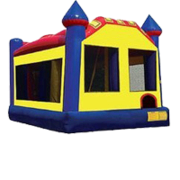 Castle Bouncer 5n1 Combo with DRY Slide Bounce House. Jump, shoot the basketball, climb through obstacles, climb up the steps and SLIDE down ALL IN 1. This all in 1 Bounce House Combo is a great rental when you want to keep the kids all in one spot. This Bounce House is also great when the sporting event is on TV and you want to kids to keep busy so you can entertain and watch the game.